How do you improve on the number 1 wedge on the PGA Tour? That was the challenge that Titleist's Master Craftsman, Bob Vokey, faced when trying to upgrade the Titleist SM4 wedge. Vokey's designs are built for, and in collaboration with, some of the best players in the world, including Adam Scott, Steve Stricker, Jordan Spieth and Jason Dufner. It was with feedback from these players along with Titleist's R&D team that he created the new SM5, or Spin Milled 5, wedge. Available in three different finishes, with six different grinds, in nine different lofts, Vokey says the new Titleist SM5 wedge is more compact that before and offers more spin, in more options, than ever before. I’ve always said I have the best R&D facility in the world – the PGA Tour. I worked closely with our team of craftsmen and engineers to apply everything I’ve learned from the best players in the world to Spin Milled 5. We’ve increased the spin. We’ve given players more control. And we’ve got a bounce and grind matrix that will provide the versatility and confidence to hit a variety of shots around the green and get up and down more. Sounds good right? So how did he do it. To start, Vokey and his team took a close look at the grooves. The SM4 wedge was designed to deliver the maximum conforming spin, as allowed by the R&A and USGA rules. The new TX3 grooves on the SM5 have pushed that performance even further. The new grooves are 7% larger and deeper than before, milled using Titleist's proprietary spin milled technology to ensure the the maximum dimensions allowed. For the wedges with lofts of 46 to 54 degrees the grooves are deeper and narrower to offer better distance and trajectory control on longer/fuller shots whilst also reducing the chance of the ball flying or jumping out the rough. On the higher lofted wedges, from 56 to 62 degrees, the grooves are the same width as before but again slightly deeper. This allows for more spin around the greens, especially out of greenside rough. Titleist say that players will experience up to 400 rpm more spin with the lower lofted wedges, and up to 500 more with the higher lofted models. 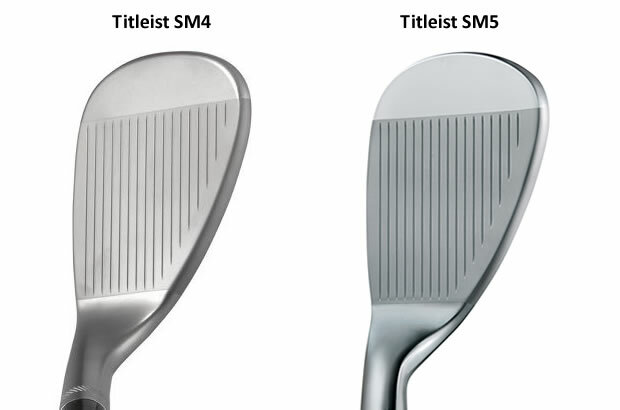 In terms of looks and profile, the SM5 is more compact than the SM4, with a shorter blade length. Vokey spoke with Tour players to learn about what it is they like to see behind the ball around the greens. The new design incorporates a rounder toe profile, as well as a higher toe and heel height. If you ever get the chance to talk with Bob Vokey, your conversation will no doubt touch on wedge grinds. The grind of a wedge related to the shaping and bevelling of the sole. It manages how the wedge sits and interacts with the ground. For the SM5 wedge, Vokey has created six tour-inspired grind options. With wedges, it’s never one size fits all. Wedges are required to hit many different types of shots. And every player has a different technique, a different style. That’s why we have so many options. It’s important that players see an authorised Titleist fitter to get fit for their SM5 wedges, so they know they’re playing a setup that fits their game. In order from left to right above, here's an idea of what each grind offers. The F-Grind is the most basic grind. It features a full sole with a moderate camber and a slight trailing edge relief designed for most type of ground conditions and players. The SM5 S-Grind is a fairly neutral shape that features a full sole, slight trailing edge ribbon and a moderate amount of heel relief. It will fit most conditions and swing types. The S-Grind is used by, but not named after, Steve Stricker. Steve has a shallow angle of attack, with little to no wrist action. The S Grind gives him the versatility to hit many different shots around the green, even with his neutral style. The M-Grind is designed for firm conditions or "sliders", i.e. players that don't take much of a divot. It has a narrow crescent sole and minimal camber but offers a mid bounce. 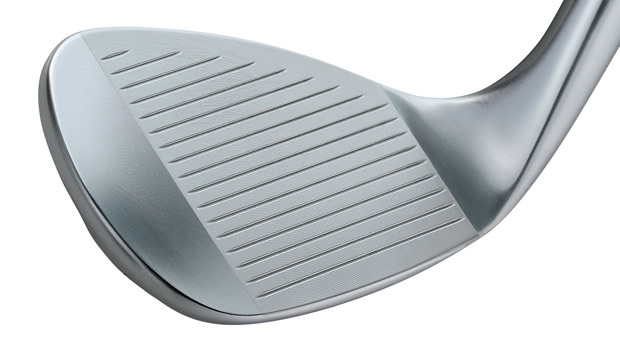 For players that like to rotate the face open, the M Grind is a very popular option. The K-Grind has the width sole design, along with an increased bounce angle and enhanced camber. It is specially designed for softer conditions or players that tend to dig with their wedges. It is used by both Adam Scott and Jason Dufner. Both Adam and Jason were looking for a sand wedge that was very forgiving out of the bunker, but still allowed them to hit a lot of different shots around the green. When Adam put it into play last year at Augusta National, with all of its tight lies, I knew we’d found it. The T-Grind has Vokey's dual-bounce sole. It's wide trailing bounce grind is suited to firmer conditions and a more sliding, non-digging, swing path. Finally, the L-Grind, very similar to the M-grind, features a narrow crescent sole shape for players that tend to slide under the ball, or players that tend to play in firm conditions. It has a small, forward bounce and very little camber. Each sole grind is only suited to certain lofts, thus the SM5 is available in 21 different loft, bounce and grind options, shown below. Each of those 21 models is available in Titleist's Tour Chrome, Gold Nickel or Raw Black finish. They can also be personalised through Titleist's custom shop with a wide selection of shafts, grips, ferrules, stamps and paint fills. I’m looking for a lot of versatility. I’m looking to be able to hit it high, hit it low, shots that are going to spin back but, also shots where they can drop and just stop where they land. My favourite shots are those low spinners, those two hop-and-stop pitch shots from 30-40 yards – they’re awesome with the new SM5 wedges. The Voke looks back on groove rule change & discusses future.